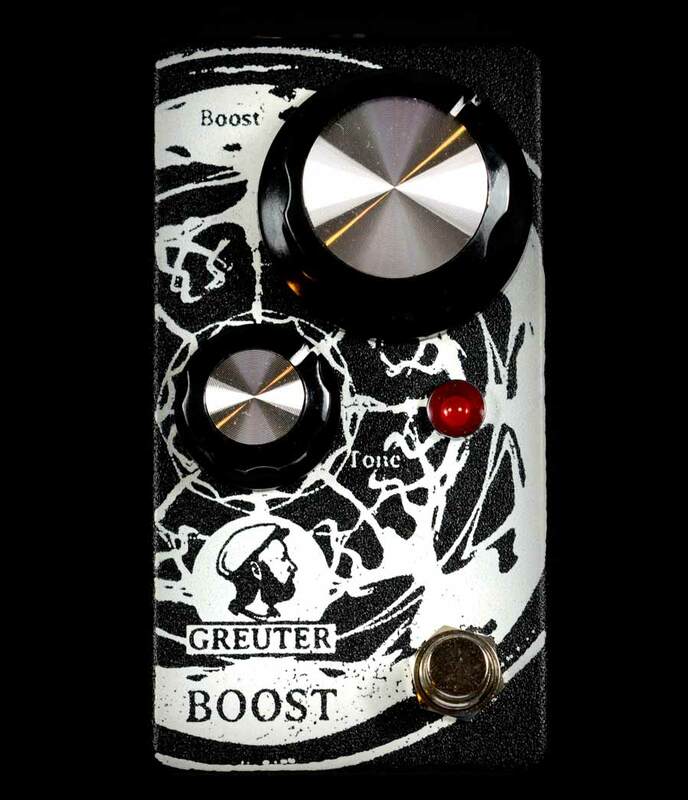 The Greuter Boost is based on the legendary Rangemaster Treble Booster. 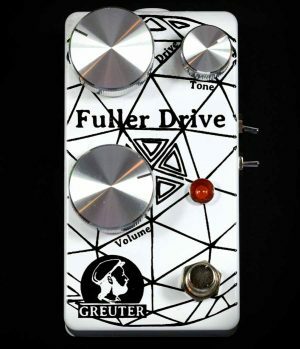 It boosts treble (actually upper mids) and makes your guitar sounds dirty with a slightly overdrive. The Greuter Boost is no Clean Boost!. Cuts very well in the mix, pushes overtones into feedback. 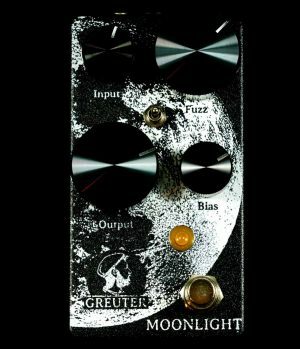 Works very well with cranked small low wattage tube amplifiers or boost into your favourite overdrive pedal. The Greuter Boost is based on the legendary Rangemaster Treble Booster. 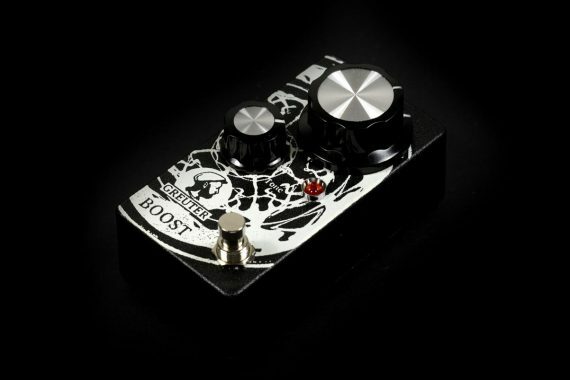 It boosts treble (actually upper mids) and makes your guitar sounds dirty with a slight overdrive. The Greuter Boost is no Clean Boost!. Cuts very well in the mix, pushes overtones into feedback. 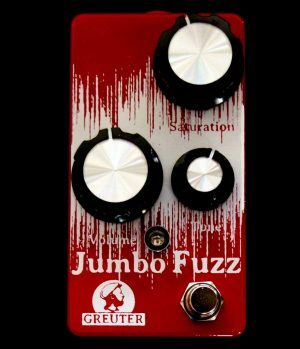 Works very well with cranked small low wattage tube amplifiers or boost into your favourite overdrive pedal. 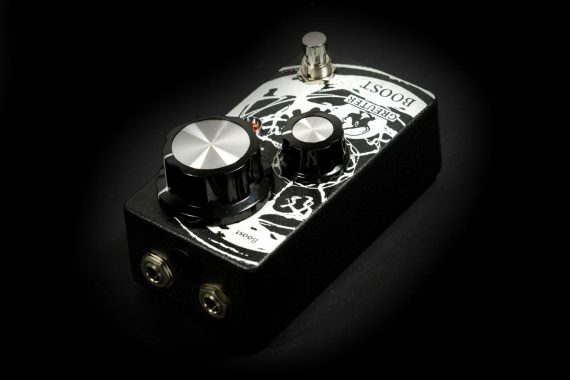 It’s a simple little pedal which adds musicality to your rig. It’s very dynamic and clears up beautifully when you roll down your guitars volume. Great to reproduce the guitar tones of Eric Clapton (Beano and Cream), Jimmy Page, Jeff Beck, Ritchie Blackmore (early Deep Purple, Tony Iommi (early Black Sabbath), Marc Bolan (T-Rex), Brain May (Queen) and many more. Hand built in Switzerland, true bypass, Switchcraft plugs, big knob, hand selected and biased germanium transistor. 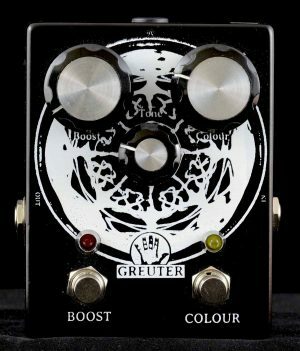 The Greuter Boost has an internal polarity converter to use it with normal 9V adapter. So there’s no hassle with using only batteries or a special power supply. Works with 9V dc adapter (negative tip). We suggest a regulated and isolated power supply. Version 2 (V2) is now available. New it has the Tone pot instead of the Treble&Bass switch and the jacks are top mounted.